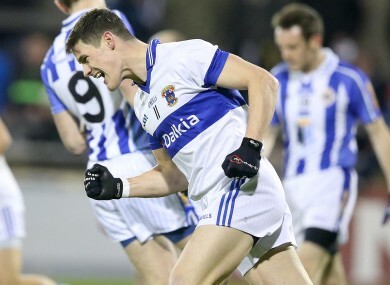 St. Vincent’s Diarmuid Connolly celebrates scoring a goal in last Monday's semi-final. THE ATTACKING PARTNERSHIP between Diarmuid Connolly and Tomas Quinn has been a pivotal factor in propelling St Vincent’s to next Sunday’s Dublin county senior football final. And one of those who suffered against their forward play believes it is crucial that reigning champions Ballymun Kickhams handle the threat of the duo in the decider at Parnell Park. Michael Darragh MacAuley was part of the Ballyboden St Enda’s side that lost out to St Vincent’s in last Monday night’s county semi-final by nine points. Connolly and Quinn fired 2-6 between them and St Vincent’s will hope they can replicate that form as the club chase their first crown since 2007. “They’ve been playing together for so long. We found both very hard to get a hold of and never did at any stage. “I obviously know how Dermo is going from training – but I hadn’t seen Mossy this year and he was flying it. He blew us away. If Mossy Quinn and Dermo are in the same sort of form they were in against us, they’re going to be tough to stop. “We got a bit of a swagger in our step after getting over Brigid’s and Crokes when they were both heavily fancied. But we just never got going against St Vincent’s. “I suppose you could compare it to the Kerry semi-final, but at least we (Dublin) came back and (Paul) Mannion got the fist to that goal that put us back in the swing of things. “The killer blows were the goals coming so early. But we never really got that rub of the green against Vincent’s and they just went on. They were the better team on the day. No argument about it. Michael Darragh MacAuley in action last Monday night. Yet MacAuley believes Ballymun Kickhams desire to atone for the All-Ireland club disappointment of last St Patrick’s Day could be crucial. “What they have now is a stone that is probably left unturned that they want to turn over. If they had won the whole lot, it might have been tougher. “They came so close last year. And I’m sure that’s where their sights are. They’ll start off with the Dublin Championship but they will focus on getting back to Paddy’s Day. Email “'Mossy and Dermo are going to be a tough animal to tame on Sunday'”. Feedback on “'Mossy and Dermo are going to be a tough animal to tame on Sunday'”.